Thirty-two members of fugitive former Libyan leader Moamer Kadhafi's inner circle, including his son Saadi, have arrived in Niger since September 2, Niger's prime minister said on Monday. "A total of 32 people are now here, including one of (Kadhafi's) sons, Saadi, as well as three generals," Brigi Rafini said during a meeting with foreign diplomats in Niamey. 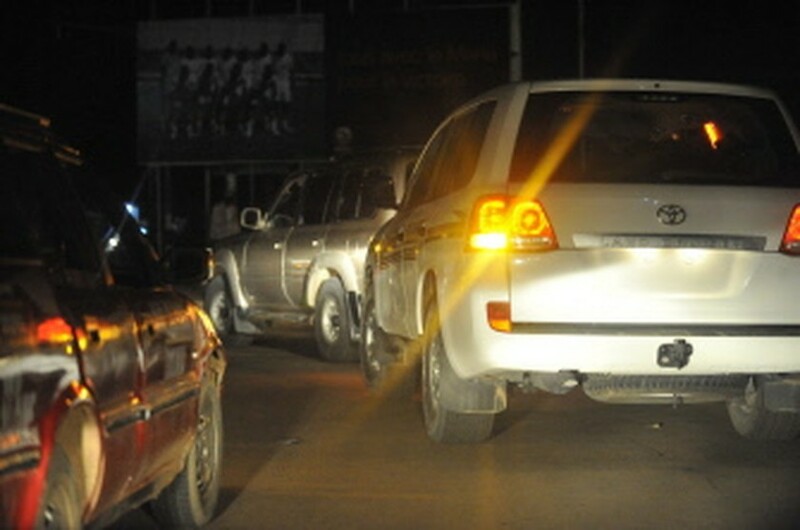 A convoy (R) of cars transporting unidentified persons enters Niamey on September 12, 2011. The most recent arrivals included Saadi and eight other close associates of Kadhafi senior, added Rafini in comments carried out by public radio. Other sources told AFP earlier Monday that Saadi "still hasn't reached (the northern regional capital) Agadez and is somewhere in the desert". But Rafini said none of those known to have crossed over the border were being sought by the Hague-based war crimes court. "As far as we are aware, none of the 32 in Niger are being sought on an arrest warrant or being pursued by internatonal justice," he said. The three generals include Al-Rifi Ali al-Sharif, Kadhafi's air force chief, his bodyguard Ali Khana, who was also chief of the forces in Awbari in southern Libya, and another regional military commander from the south, Niger officials have said. Rafini voiced serious concern over the effects the Libyan conflict would have on his country -- already grappling with unrest linked to Al-Qaeda in the Islamic Maghreb (AQIM). AQIM, which emerged out of an Algerian radical group, has several bases in Mali from where it launches operations in the Sahel desert region, carrying out attacks, kidnapping foreigners and trafficking drugs. "All the arms depots in (Libya) have been opened, many people have helped themselves and many weapons have gone from Libya to neighbouring countries for ends that are certainly not peaceful," Rafini said. A security source told AFP that Saadi Kadhafi was en route to Niger's capital, and "would probably arrive in Niamey in the early evening" -- although a government source said he was still in Agadez, which is about 1,000 kilometres (620 miles) from the capital. Meanwhile in Washington, the US State Department said Niger was preparing to detain Saadi Kadhafi. "We have confirmed with the government of Niger that Saadi crossed over, that they are either in the process or have already brought him to the capital of Niamey and intend to detain him," spokeswoman Victoria Nuland said.